How To Increase Battery Life Of Android: These days most of us owns smartphones and these smartphones are mostly running on Google’s Android mobile operating system. This smartphones with android OS got bulk of features to be used by user. We use our smartphones for various tasks like checking emails, playing music online & offline, watching movies, notes-taking and online videos, playing games, GPS navigation, office work and many more other important tasks. For doing all these tasks on our android smartphones, we need long battery backup. In fact low battery backup is a major problem of today’s android smartphone. You can not expect long battery life even from a high-end android device. Android smartphones contains many battery consuming features. One of biggest hurdle in saving battery life of android is it big screen. Manufacturers are giving battery with more power in their android smartphone. But this step can not give a major impact on battery life of android. To improve battery life of android devices, you just need manage mange the battery consumption in proper way. In this article, we will provide you tips to improve android battery life. Remember one point we can increase battery life of android only by saving battery life. 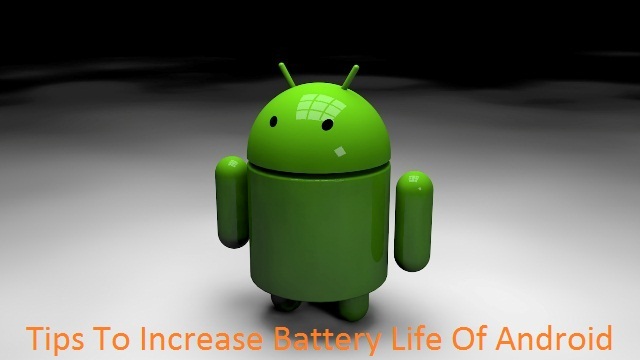 Let’s proceed to know about tips to increase battery life of android smartphone. Below are the android battery saving & management tips to extend android battery life. Display of an android smartphone is the die-hard battery juice consuming component. A smartphone with bigger display likely to have low battery life. More bigger the display, less will be the battery backup. It’s the fact that manufacturers are making android smartphones with bigger & brighter display as consumers wants it. At this point, to save battery consumption for screen, you have to keep the brightness of the display as low as possible. It is recommended to not enable the feature of auto-brightness. But you should manually set the brightness level according to conditions. You should set the brightness level to its lowest, if it feels comfortable. Adjusting brightness level is one of the best way to increase battery life of android smartphone. Apps are the way we use our android smartphone. So we should use only that apps which we really need. To save battery life of your android device, its wise to uninstall all unwanted app which we don’t need. Some of these unwanted apps run in background and consumes memory & CPU usage. It will make battery juice to drain fast. Wi-Fi, GPS and Bluetooth services are battery hogging services so we should use these service only when we really need them. It’s better to disbale these service if not in use. Some people keep the Wi-Fi service ON 24*7. It will drain their battery charge very fast. In most of the android smartphones, you can disable these radio service by swiping doing the notification bar. You can also go to settings to switch-off these services. It’s recommended to switch-off vibration feature as it takes more battery to vibrate rather than just ring. Also disable the haptic feedback as we can also efficiently use our phone without haptic feedback. CPU Underclock: Underclocking the CPU is the best way to improve battery life of android. CPU of the smartphone also consumes battery power according to its speed or frequency. If CPU runs on higher frequency, it will consume more battery. We can stop more battery consumption by CPU by undercocking it. Underclocking of CPU is only possible after android rooting. Stop or Freeze Unwanted Apps or Processes: There are some apps in android device which keeps running even after stopping it. They restart after a while. We can permanently stops or freeze these type of apps or process thus saves battery usage. You can only stop or freeze processes permanently after android rooting. After rooting android phone, you can use apps like SetCPU and Greenify. These two apps are developed in order to save android battery life. Screen timeout also plays an important role in battery juice consumption. If screen remain active for more time, it will consumes battery juice more. So it is advised to keep screen timeout to minimum. You can set it its minimum of 15 seconds. This tips can easily extend battery life of android device. It is recommended to disable auto-sync to increase battery life. Auto-sync runs in background and consumes battery juice.In fact you can manual sync your Google accounts data at a given time. Custom ROMs like CynogenMod are customized android ROMs which are optimized to make your smartphone’s hardware to run at it best performance. These type of Custom ROMs have built-in power saving features & are optimized for better battery usage. You can also android’s home screen to save battery life. We recommended you to keep android’s smartphone home screen as simple as possible. To save battery life, use still wallpapers instead of live wallpapers. Live wallpaper keeps screen busy and reduces battery juice. If possible, use less widget on home screen. To extend battery life, you can also use a dark wallpaper, if you phone has AMOLED display. Android Battery saver apps are designed in such a way to provide better battery management to your phone. These battery saver apps can easily boost android battery life, if configure correctly. Some of the best android battery saver apps provides features like CPU Underclock & Overclock (root require), Radio services management (Wi-Fi, Bluetooth and GPS), Auto brightness control and more. It’s highly recommended to keep all installed apps updated. Latest version of app is likely to consume less power than an outdated app. For it, keep ON the automatic updates of apps in Google Play Store. Turn-off the notification for apps for which notification are not necessary all the time. Use darker background in apps, if it allows. Instead of automatically updates apps manual update them. Because in auto-update, many apps will start their process of update which will consume more battery. Always use recommended and branded battery for android smartphone. Use latest version of android operating system. Now you can easily increase battery life of android devices by applying these above tips on your device. You are assured to get improved android battery life, if you strictly follow all these tips for few days. If you know about any other trick to extend battery life of android, include that with your response in comment section.